My local yarn shop is doing a series of contests over the summer with the winners (and a random voter!) winning sweet, sweet yarn. It is $60 for the winner and $30 to the winner of the voter’s drawing. What a great promotional idea, right?? Anyway, the first contest is a knit monster. Ooooooo scary. No, they’re actually pretty cute. 🙂 You can vote for your favorite monster on their Facebook page here or on Nancy the owner’s blog here. Folks are allowed to vote once through each venue. Don’t forget, that’s two entries to win $30 of free yarn!! And my own shameless promotion… my monster is #11 – Mr. & Mrs. K2tog and I if you are a KT customer I would sure appreciate your vote. 😉 Don’t forget you have to “like” Knitted Together on Facebook in order to vote on their page. That being said… I have never won a drawing. Ever. For anything. Ahh, persistence… I will not give up! Haha. Anyway, that brings me to the real meaning of today’s post. I found a post on Ravelry where crafters (namely knit, crochet, and yarn folks) can list their sales, blogs, contests, and promotions. Yippee!! I spent most of Saturday morning signing up for April contests and then bookmarked the page for future reference. Tell others about their giveaway, contest, etc. Again, great promotional idea, huh? I also got a great idea from Crochet My Love Designs on Ravelry. She posted a new pattern and put a link to her Facebook page in the pattern’s description. She then told potential buyers that a “Like” on her Facebook page would earn them a free pattern! Woo hoo! I love all of these promotional ideas and am excited to try them out when K1 Sew Too is a little more robust. If I am going to have a lot of people viewing my pages and work I want to be able to “show them what we’re made of”, so to speak! Blog – A yarn giveaway! And some cutsie pictures. Mmm…. yarn! Blog – Winner gets pretty dishcloths, chocolate, soap (the kind I use! ), and chap stick. Blog – Winner gets one of three patterns. There’s a really cool shawl/jacket and a nifty hat/cowl as well. Blog – This contest was to win some BEAUTIFUL yellow yarn. The contest is over and I didn’t win… but the yarn is still gorgeous and I have added a new, cool company to K1 Sew Too’s likes on Facebook. Well, that’s about all I have for now. I hope you enjoy the drawings, giveaways, etc listed. Is there a special place you go for great deals? If so, please share! Well, folks, I think I may get to check another goal off my list come this weekend! A family friend has a booth at Heartland Fiberpalooza and has been granted permission to let me sit at her booth and bring some of my items. (I don’t have enough items for my own booth yet.) I have been feverishly making bunny fridgies and other small items to try to sell. 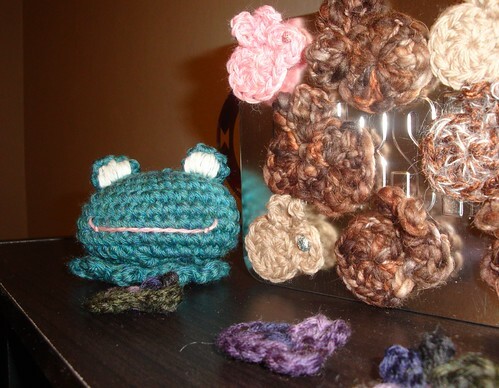 I think by Saturday I’ll have some fridgies, a felted frog (he’s not felted yet in the pic below), three hats, a scarf, and one headband. Plus whatever I can finish tomorrow. 🙂 Either way, I’ll have some business cards and should meet some nice fiber folks! You should come if you have $3.00 and some spare time! I especially invite all yarn enthusiasts as there will be a lot of yarn vendors at the show. Upon waking in the wee hours this morning I remembered a dream. I normally don’t remember my dreams, but when I do remember them they usually build upon something I was doing or thinking about the previous day. (Makes sense.) Well, yesterday I was thinking about making the Pegboard Lace Tunic. More specifically I was thinking about the yarn needed to make one similar to ShellularKellular’s (on Ravelry.com) version. So do you ever dream of luscious yarn? Or even better, have you ever had a dream about a project to knit or crochet or a pattern to write? A note on Sea Silk… It is made of 70% silk and 30% SeaCell. Apparently “SeaCell” is a name HandMaiden Fine Yarns coined and it is comprised of 70% Tencel derived from pulpwood and 30% Tencel derived from kelp. I found an article on Tencel that explains the process of deriving fibers from pulpwood; however, it doesn’t mention the kelp process. Anyway, if you are interested in the eco-friendliness of Tencel or the process you might find this article interesting.